There are several reasons to choose container gardening. Container gardening can brighten up a patio, porch, balcony, or window. Garden design becomes mobile. You might have very poor soil, a restricted area for planting, or be physically unable to get around in outdoor areas (e.g., being confined in a wheelchair). The mobility factor allows you to move the plants to different areas in the yard to take advantage of more sunlight and create different looks to your landscape design. This also allows you to move the plants closer to the house to protect them from the damaging effects of Mother Nature (e.g., wind, hail, heavy rain or frost). Almost any container can be used for container gardening. Outdoor flower pots come in many different sizes and materials such as wood, plastic, clay, ceramic, metal, and fiberglass. Outdoor planters can include barrels, tubs, window boxes, and pails. Select a container that's in proportion to the plants you choose. In this photo, Cathy took a number of plants that were in various sized containers and using a few bricks made a great display of plants in the corner of the driveway. Just arrange the plants according to size, with the larger plants and pots in the back, tapering to the smaller ones. One of our favorites for container gardening is the window box planter. 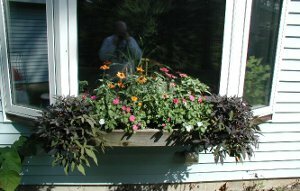 Window boxes come in various styles and depths. Measure the window to see what length window box you need. For the window box, select smaller sized plants. Combine flowers with colors that complement each other to achieve the look you want. The location of the window box, in full or partial sun, will generally dictate what plants will be best suited for its location. Our window box is in full sun and Petunias and Impatiens do very well. However, a recent attempt at mixing plant heights was quite a surprise. We had a few Zinnia seeds that we sprinkled in the back of the box. By the middle of summer, the Zinnias were so tall they almost reached the top of the window (about three feet). Periodically pinching the tops would have kept them at a much lower level. The photo to the right shows one of our window boxes. We had smaller Zinnias, Impatiens, and sweet potato vines in this one. The size of this window box is about 6x6x48 inches. Window boxes tend to dry out more quickly because of the smaller amount of soil, so frequent watering is necessary. Hanging Baskets are another popular method to add interest and gardening space. There are many types of hanging containers available from growing bags, to the more decorative coconut fiber baskets.Wrought iron wall and Shepard's hooks are popular devices for hanging containers, they come in many styles and are portable, allowing you to change the look of your container garden to suit the season and your mood. Bear in mind that any device that you use for hanging baskets needs to be sturdy enough to support the weight of the container. Obviously, the larger the container, the heavier it will weigh. You need to use lightweight potting soil or user fillers as mentioned below. Choose a pot that is appropriate for your full-grown plant. The general rule of thumb for container gardening is the bigger the better. See below for container size recommendations for vegetables. Larger plants and shrubs will require larger pots to keep them from falling over. If you choose to grow viney plants, that need a trellis for instance, a larger, heavier container will also be needed to keep the planter from tipping over. Always check the bottom of the container to make sure it has sufficient drainage holes. A lightweight potting mix should be used when gardening in a container. Soil straight from the garden shouldn’t be used in a container because it is usually too heavy. The only exception would be if you need the extra weight and the containers won't be moved around much. Container gardening medium should be porous to allow air and water to get to the roots. Packaged potting soil available at local garden centers is relatively lightweight although the expense of prepackaged or soil-less mixes can be high. You can mix your own with one part peat moss, one part perlite, and one part mason’s sand, and a slow-release fertilizer. If your container is very large, you can reduce the amount of soil needed by adding crushed cans, milk bottles, or foam peanuts to fill in the bottom of the container. This will make a large container lighter and the plants won’t mind a bit. One of the drawbacks to container gardening is the fact that your plants will need continual watering and fertilizing. The roots of the plants are confined in the container and they can use all the water that is available to them, and then some. Also remember that with the constant watering, many of the nutrients in the soil are leached out as the water drains from the container. There are some good all-purpose fertilizers on the market that can be mixed in water or just sprinkled on the top of the soil. Timed-release and water soluble fertilizer can be used for container gardening. Timed-release is added at planting time, and should be thoroughly incorporated into the soil mix. Look for a complete, balanced formula. Follow the directions on the container for the proper application rate. Water soluble fertilizers are added about mid-season when the plants begin to produce blossoms. This additional fertilizer is needed to add nutrients that have been used by the plants or leached out of the soil. In a container the plant's roots are restricted and thus somewhat stressed, and watering leaches valuable nutrients out of the soil. Adding a "super bloom" fertilizer, one with high phosphorus (P), or the middle number in the fertilizer analysis will stimulate blooms and fruits. The water soluble fertilizers should be mixed at a slightly weaker rate than the label recommends and added once every week or two. You can also use manure or compost teas, or fish emulsion for organic container gardening. Be sure that any manure that you use is thoroughly aged. Plant selection and the design of your container garden should follow the basic rule of "thrill, fill and spill." Larger, more dramatic plants are surrounded with smaller, complimentary plants and trailing plants are used to spill over the planter giving it a softer look. Remember that plants grown in containers need as much sun as they would in the garden. Flowers and fruiting vegetables need at least six hours of sun daily. If you have less sun, grow leafy vegetables or herbs. When looking for suitable varieties select ones that are described as “bush” or “compact” that have been especially bred or hybridized to be smaller. 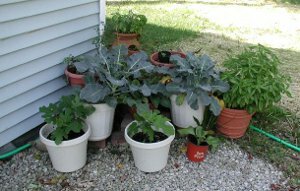 There are dwarf varieties of the larger vegetables that will grow well in containers. Greens, such as spinach and lettuce have more shallow roots and will grow just fine in a broader, flat container. Vegetables suitable for window boxes: Beans and onions. Vegetables that do well in small containers: Beets, Lettuce, Radish, and Spinach. Vegetables that require a larger container: Broccoli, Carrots, Eggplant, Peppers, and Tomatoes. Vegetables that require a very large container: Potatoes. Be creative and mix vegetables into your flower containers as fillers (beets, carrots, bush beans) or as spill plants (pole beans or cucumbers). To add color in your vegetable container gardens, add a marigold, Coleus, or Caladium. 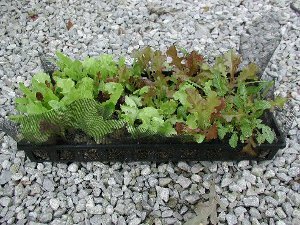 being able to grow the lettuce vertically in "shelves," shading the lettuce in the summer heat, and saving water as the water from the top trays trickles down to the trays below. Rotate the flats every day or so to give them equal amounts of sunlight.